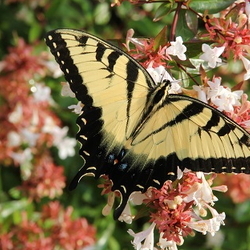 Gardeners love the 'flying flowers' we call butterflies and attracting them to our property is important to many of us. They have been the subject of many stories and legends throughout history and never fail to bring a smile to faces young and old. Butterflies come in a huge range of sizes, shapes and especially colors. They have been popular in art, song and poetry for thousands of years, besides being our favorite garden visitors. There are cave paintings in the Pyrenees depicting butterflies and the ancient Minoans decorated pottery and tiles with their images over 4000 years ago. We dedicate whole gardens to their happiness and well-being, so let's take a look at some of the lore surrounding these beauties. Native American's had many beliefs about butterflies and one of the most prevalent across a number of nations was the one that butterflies make wishes come true. It was said that if you whisper your wish to a butterfly and then release it, it will take your wish to the Great Spirit, who will then grant the wish. Since butterflies are silent, only the Great Spirit (who hears and sees everything) can hear each wish. Butterflies were believed to carry dreams to us when we sleep. Mothers of the Blackfoot tribe often tied a small piece of leather to a child's hair with a butterfly painted on it to ensure sweet dreams. The Cherokee and Shoshone peoples have a special ceremonial dance called the Butterfly Dance where the women use brightly colored shawls to represent butterfly wings. The dance tells the story of tragedy and the eventual rebirth of happiness, as a woman who has lost her love travels the earth with her wings packed away, until her sorrow was finally healed and she was reborn. Many cultures believed that the dead were reborn as butterflies. From the island of Samoa to Germany, Pacific Northwest and India, legends and lore abound concerning the rebirth of souls as butterflies. Irish legends say that butterflies hold the souls of the dead until they pass into Purgatory. The ancient Greeks were more succinct. Put simply, their word for butterfly was the same as their word for soul...'psyche'. Butterflies are a universal symbol of beauty and happiness today. We've all seen everything from children's cartoons to advertisements featuring them and every little girl thinks they're grand. We have butterfly tee shirts, key chains, notebooks and hair accessories just to name a very few things that feature our winged friends. It is probably one of the most universally accepted images of happiness and butterflies bring smiles to everyone who sees them. These flying jewels are easy to attract to the garden. They don't ask for much. Do a little research into what your native species prefer as host plants. Each species uses specific plants as hosts and they will only lay eggs on those plants, and the caterpillars can only eat them instead of any other plant. 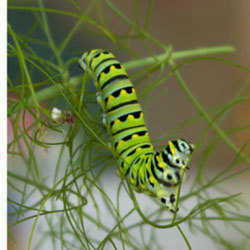 If a caterpillar is removed from a host plant and placed on another species, it will die. If adult butterflies find acceptable host plants in your garden, they'll lay their eggs and caterpillars will hatch. If you want butterflies, you have to have caterpillars and caterpillars eat their host plants. Be prepared for chewed leaves and stripped stems, it is just part of the process. Planting the host plants in an inconspicuous spot is usually a good idea if you like things neat and tidy. Do not use insecticides nearby, or at all. Why risk their safety and insecticides do humans no health favors either. When the butterflies emerge from their chrysalis' they are attracted to brightly colored flowers such as zinnias or asters. The flat-topped, disc-shaped blossoms make perfect 'landing pads' for a number of species and your garden should be a'flutter on sunny days. 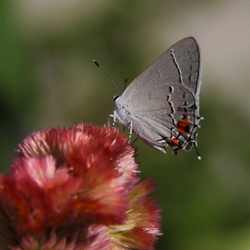 Butterflies are most active where it is warm, so it is no wonder that the flowers they prefer are sun-loving as well. Give butterflies a muddy area where they can sip minerals from the damp soil. This is called 'puddling'. The damp soil has compounds that healthy butterflies require, and many males of numerous species require these minerals to be able to breed, so a sunny, damp area is an excellent idea. Many gardeners hang a bucket with a slow drip over their puddling area to keep the soil moist and it is not uncommon to see dozens of butterflies perched around their favorite muddy spot partaking in the tasty mineral soup. Butterflies like the sun and are more active on sunny days. 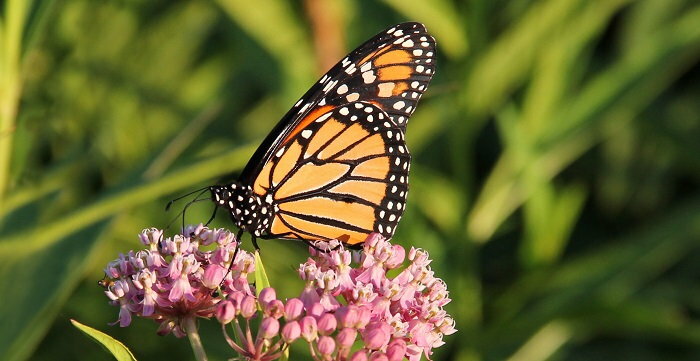 They tend to be sluggish and lazy on cooler, cloudy days, so devote the sunniest part of your garden to butterfly nectar flowers and they'll reward you by showing up in droves. You'll be helping an ancient and beloved creature to thrive and continue spreading happiness for years to come!